I love listening to Dave Ramsey on the radio. I have implemented much of what he teaches in my family’s finances. I don’t always agree with everything Dave has to say, but rarely is my disagreement so ardent. I was listening to Dave several days ago, and a gentleman called in to ask about a marriage question as it relates to finances. He was about to get married, but many people had told him he needed a prenuptial agreement. The caller seemed hesitant to do it so he asked Dave’s advice. Dave asked the necessary questions to estimate his caller’s net worth, and it came to $1.5 million. Even though it was slightly under Dave’s threshold of $2 million, Dave advised him to get a prenuptial agreement in place before the wedding. His rationale? Crazy people are attracted to money. Dave assured the caller that his future bride is probably not crazy, but she probably had someone crazy in her family (don’t we all?) who might try to take his money if the relationship went south. There is a bad spirit over prenups. It’s planning your divorce in advance. What you put your eyes on is what you end up getting. There is one exception to this rule. If your fiancée is an heiress and was wealthy already, I would change my answer. If I die and my wife remarries, I have told her to get a prenuptial agreement. When there is extreme wealth, more than a couple million dollars, weirdness is attracted to that. When I’m dealing with a professional athlete making millions of dollars a year, I recommend a prenuptial agreement. Because of the wealth, you have a higher potential to attract weirdness. I think you’ve got a valid concern. I also think you need to do a lot of premarital counseling and discussion about money because you have an extra strain on your marriage. You don’t—as a man—want to put money on a bigger pedestal than your wife. You want to love her well before you love money well. Having said that, you have this extra responsibility and strain on your relationship. You really need to dig into that in your premarital counseling and talk that through because it’s a potential stumbling block for you later on. So Dave is generally against prenuptials for the right reasons—they basically admit you are not committed to the relationship already and want to divide up the spoils before the divorce ever comes. They just don’t communicate the spirit of marriage—two becoming one. Dave even regularly recommends pre-marital counseling with a pastor for engaged couples. However, Dave changes his advice about prenuptials on the basis of wealth before marriage. Why is it fine if you’re already worth $2 million or more? His only rationale is that money attracts weird people. While I respect Dave’s opinion, I believe he is being inconsistent on this point. Marriage is marriage no matter how much money is involved. Yes, wealth can bring extra strain to the relationship, as can poverty. Those marrying into money can be perceived as (and sometimes are) gold-diggers. However, marriage is the union of a man and a woman as one in all aspects of their lives. Otherwise, it is just a contract with the terms for the dissolution of the contract drawn up before things begin. Marriage is more than signing a cell phone contract for two years with a $250 penalty for switching providers early. 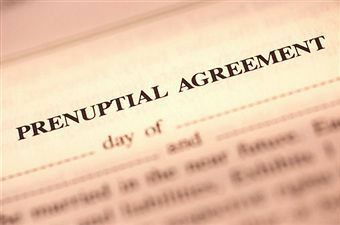 Should the church have anything to say about prenuptial agreements? Certainly! As pastors perform pre-marital counseling and teach about marriage from the pulpit, I believe they should describe how prenuptial agreements detract from the God-ordained picture of marriage. They take away from the idea of two becoming one flesh (Gen 2:24). In addition, prenuptials are directly antithetical to the picture of marriage as the relationship between Christ and the church (Eph 5:22–33). If there were anyone who deserved a prenuptial agreement, it is Christ in his relationship with the church. His surpassing riches of grace (Eph 2:7) far exceed the paltry contribution that we bring to this divine marriage. Our wealth is like filth by comparison. However, Christ gives all of himself to his bride knowing that she will at times be a little weird and perhaps even unfaithful. Thankfully, we can be assured that: “If we are faithless, He remains faithful, for He cannot deny Himself” (2 Tim 2:13). Dave Ramsey, “Dave’s Thoughts On Prenuptial Agreements,” daveramsey.com. Dave Ramsey, “This Case Calls For A Prenup,” daveramsey.com.